Is not a concept much known to my American neighbours. "Oh how sweet, you and your husband are both wearing matching red flowers!" etc. 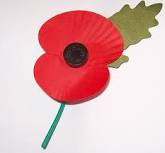 I have to ask British friends to get poppies for me in London. There are Canadian poppies but they seem foreign, a different shape, stiff and velvetty. If Americans do have poppies, it's for Memorial Day in May, when those who died in action are commemorated - and they are small, more like buds, really and hard to come by. Americans don't have Remembrance Sunday - though they might play some patriotic music after Mass and sometimes it's My Country Tis of Thee, aka God Save the Queen and I'm the only one standing while everyone else is rushing out for coffee and doughnuts. November 11th, now called Veterans' Day, is observed as a public holiday and banks and some businesses are closed but it honours all military veterans, including those still living. Here, you could almost not know it's happening. Memorial Day came first, after the Civil War, Americans point out. But it's odd to have a sad day in May. November seems somehow more appropriate and it's one of those times when I really miss Britain.